On 22 February 2011, a 6.3 magnitude earthquake hit New Zealand’s Christchurch, claiming 185 deaths and leaving buildings in ruins. Among the city’s high profile buildings that took a severe hit was a neo-Gothic Anglican Cathedral that was irreparably damaged. As Christchurch started to get back on its feet, it became apparent that there was a need for a temporary place of worship and events’ venue. 2014 Pritzker Prize laureate Shigeru Ban was then contacted to see if he could be of help. Offering to do the project at no cost, Ban was in Christchurch in a months time (having been held up in Japan in the aftermath of the Tōhoku earthquake) and was able to come up with concept sketches in a matter of hours. 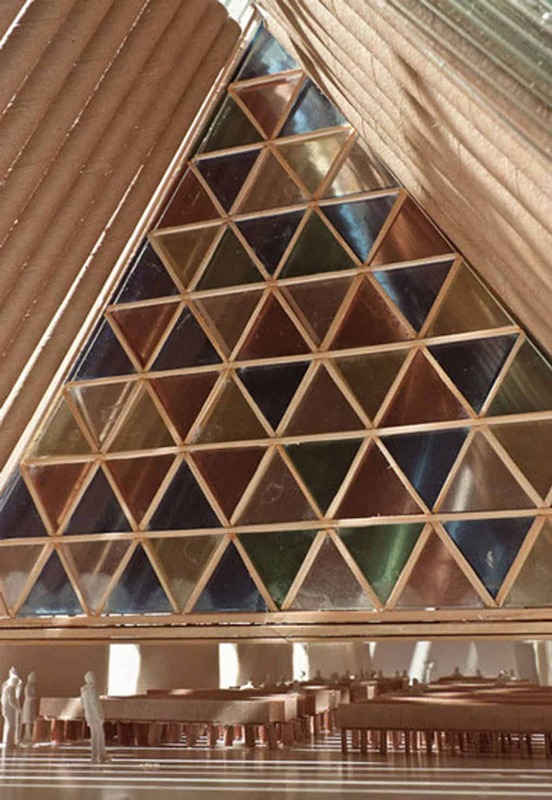 The Cardboard Cathedral is an embodiment of Ban’s famed ’emergency architecture’. It is a lightweight structure that consists of 8 steel shipping containers, 98 equally sized paper tubes and a semi-transparent polycarbonate roof. The pre-fabricated elements are brought together in an A-frame structure with the design logic that A-frames are the easiest structures to build. The cathedral became the first civic building to be completed after the rebuilding efforts began and is deemed to be the safest and most earthquake-resistant building in Christchurch. Although the building, with a life span of around 50 years, was intended to be temporary; full ownership will be handed to the Anglican parish once the congregation moves to the original site of the 1864 Anglican Cathedral. The strength of the building has nothing to do with the strength of the material. Even concrete buildings can be destroyed by earthquakes very easily, but paper buildings cannot. Initially, there was hope that the cathedral would be done quickly enough to mark the first anniversary of the Christchurch disaster. Unfortunately, a concoction of problems: delays in confirming a site, site redesigns due to tricky ground conditions and delays in construction; meant that the building took a little over two years to complete. But the wait was worth it, with the Cardboard Cathedral being an important first brush-stroke in the restoration of what is still a grim Christchurch. As a piece of architecture, the Cardboard Cathedral stands tall amongst its peers of religious typologies. 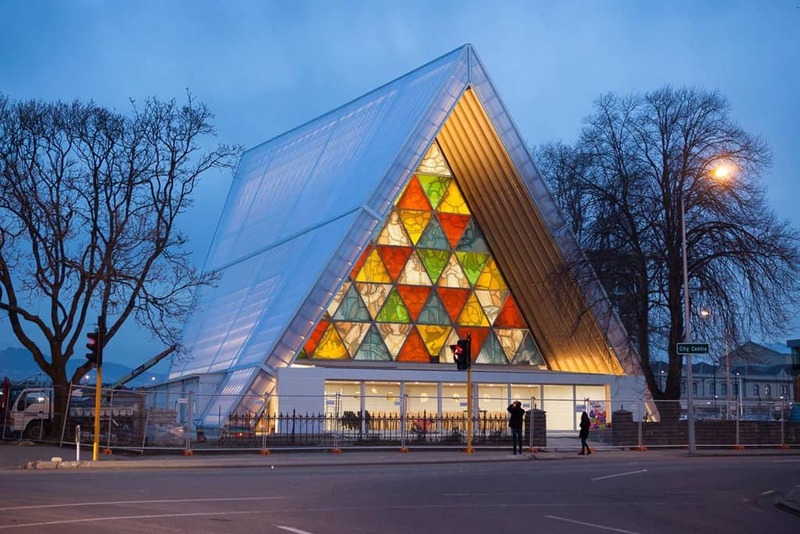 Shigeru Ban Architects managed to successfully consider the required human scale that instigates a sense of awe which is important for religious buildings. Placing shipping containers that housed ancillary programs like offices, kitchen and storage; around the buildings perimeter meant that the whole structure was propped up and its verticality could be emphasised. And with a rhythmic sequence of paper tubes that were each coated with waterproof polyurethane and fire retardants – the occupants attention is directed heavenwards where a slit of lights pierces and glorifies the space.